Finally we were heading south again. We knew the next stretch was going to be challenging. Cycling through Gansu, Qinghai and Sichuan on our way to Yunnan would bring us over many many passes and the first were coming up. We were cycling up and over 4000m+ passes in Gansu, Qinghai and Sichuan to reach the World largest Tibetan Buddhist Academy called Larung Gar in Seda. 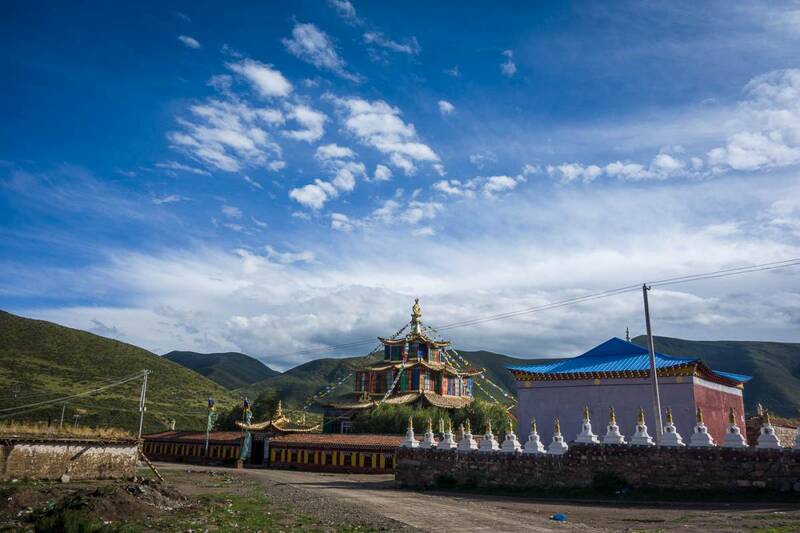 But before we cycled of we were very lucky to be in Xiahe at Labrang Monastery during a festival. Susanne was recovering from her flu and Martin went out but came back because this just had to be seen. Many many Tibetan people all in traditional dress coming together to watch the spectacle at the monastery. The hall was filled with monks and a performance was held. A very special day. The next day Susanne was walking the outer Kora, the pilgrims way along the hill next to the monastery with great views when she met Rinchen and her mother. They had also just walked the outer Kora and was straightening her clothes before walking back into town. Rinchen has been living in Chicago for the last four years with her fiancee and daughter and invited us home for lunch. Coincidentally we met with Martin so we went into the back of a small pick-up scooter and on our way to their apartment where we were treated with a traditional Tibetan lunch with noodles, meat, tea, tsampa and bread. It was nice to hear Rinchen’s view on the situation with the Tibetan people and her views on life. It was time to leave the nice town and Labrang monastery behind us, we had enjoyed our time there very much but there was more cycling to do. We cycled through grasslands and saw many yaks and nomads. Previously there were quite a few Tibetan villages, but now there were only towns and nomads, nothing in between. Unlike the nomads we had previously seen in Mongolia these nomads live in several different tents. They have black tents and white tents, most are square and they also have small tipi like tents. Sometimes there are many together and at other times there is just a single one. We were lucky when rain clouds were gathering that there was a small town with a very friendly family where we could wait out the rain. This section has been particularly rainy for us but usually the air clears and we can get on our way again. We have seen many small animals along the road, a kind of marmot and sometimes gerbils or mice running fast into their hole when they see or hear us. After taking the turnoff at Gahai Lake, a Chinese made tourist attraction, we passed through the city Maqu where we had a hard time stocking up on groceries because we didn’t understand the layout of the town. We crossed the Yellow River again (as we had done many hundreds of kilometres ago to the east) and the Chinese even tried to convince us that we saw the actual first bend of the Yellow River although the source is a few hundred kilometres further west. The Chinese are very good in signposting tourist attractions and we had seen Nyingma Temple on the signs for quite a while. Our route took us past this temple and it was interesting because it had an awkward feeling of old and new. It felt it had a strong history but we couldn’t really figure out what it was. We hid for another thunderstorm and went on our way again. These days on the road were very interesting for us because we saw many nomads packing up their stuff and moving all their belongings to a new place. They were leaving their summer location for an autumn or winter location. We saw trucks with stuff and people on top, tractors with a full load behind and people on top and often also the dog. We spoke with a few and they were heading for Aba, an area with lower altitude. The tractors would stop at streams to fill water in their cooling systems, the women would gather seabuckthorn berries from next to the road and we were gifted some and we even saw a gathering of people holding a running competition as break during their long transport. In Jiuzhi area we had the first of the 4000+ passes to climb. Again, the Chinese don’t make the roads too hard and we had slowly become accustomed to the altitude. We saw cragged peaks in the distance but still were surrounded by grasslands. All the passes are decorated with Tibetan prayer flags and it is a very special feeling to reach the top of these passes. Often people who passed us along the way wait for us at the top to take pictures. Martin had an unforgettable experience at on of the passes. He had arrived before Susanne and was getting dressed to stay warm. All of a sudden he saw a yak all tangled into the prayer flags. He was lying in a small ditch with the prayer flags around him and couldn’t move. Martin was a bit nervous but wanted to free the large animal and tried to undo the flags which didn’t work. He then cut the flags and the yak thought he was free but he wasn’t yet. A monk who had arrived in his car came over to help Martin and held the head of the yak until Martin had removed the prayer flags. Both Martin and the yak were a bit shaken up but happy everything ended okay. The female herder of the yaks came and the monk explained the situation. Definitely not an average cycle touring day. After the downhill we were in a valley and at a small bridge a yak had died, which was half under water. Their was a vulture feeding itself on the yak and two other vultures waiting for him to be done. In the vicinity there were many more vultures waiting for their turn to some. We were looking for a place to sleep but in the grasslands many of the suitable places are very much in sight. We ended up on a hillside which was very bumpy and didn’t have the most comfortable sleep but it was okay. We were now on the S101 in Qinghai and without knowing it this was quite a nice road. Of course the mountain passes were high but we came across temples and even a large monastery in Baiyu without knowing. We decided to stay the night in a small room and the next day had some time to explore the monastery. Just before Baima, a city that previously has been restricted for access to foreigners we took a turnoff. On our map we had seen that this would be a small road and we were actually excited when it turned out to be a gravel road. Many of the small roads have been turned into pavement by the Chinese. We saw nomad tents and many yaks. We received an invitation to drink tea and were happy to get the chance to look inside a nomad tent and enjoy tea with yak milk. The family was very friendly but our Tibetan is very limited so conversation was short although we tried to understand each other. We were on our way to a high pass so we wanted to continue a little bit further up the pass. We had camped on the edge of a nature reserve and were treated the whole night with rain. The next morning the sky was grey and we thought it started to clear while we were packing up camp. We had about 15 km to the top of the pass, which would be our sixth pass over 4000 meters and the first over 4500 meters in China. Because the road was not paved the rain from the night had made the road very muddy. And although we thought it was clearing, the rain started to come down more and more. The road was steep and we didn’t exactly know where the top of the pass would be because our GPS information is incorrect (something to do with an offset of the route in Google Maps in China). It was very very tough and this pass is in our top 5 of most difficult passes on this trip because the conditions were quite harsh. After four and a half hours of pushing we finally made it to the top, wet and tired but happy we made it!! We wanted to get to the next town to warm up but again information was incorrect and it was 10 kilometres further than expected. We had expected a town but it was just a checkpoint with a shop. The last town in Qinghai before crossing to Sichuan. We ate some instant noodles from the shop and went on our way. The following road was beautiful! Grasslands had ended and we were cycling along a pretty river with trees! Many dark green pine trees and we still had a slight downhill. We were happy with the change of scenery. Besides the change of scenery the houses also had changed. There are less nomadic tents in this area in the upper north of Sichuan and the Tibetans are Kham Tibetans and not Amdo. The houses are made of wood and very colourful and decorative. We enjoyed looking at the houses a lot. At a crossing of river there was a small town with many of these houses and we were happy to see a different sort of town. We turned right to cycle up the other river valley, had another 4500 pass the next day so we looked for a place for the tent for the night. The road was paved and the weather was dry which made life a lot easier on this pass and we had a great downhill to reach Seda/Sertar. Seda has also been restricted for tourism a few years ago but is opening up in a rapid speed. There are many small hotels which almost all overcharge and we have seen quite a few Chinese tourists on their way here. As for all the other tourists Seda is not the destination but the World Largest Tibetan Buddhist Academy Larung Gar 25 kilometres out of town is. We left our bicycles in Seda and hitchhiked out to Larung Gar. The car we hitchhiked with was guiding another car and took a backroad so our first view of Larung Gar was from the top which made a magnificent view of the Academy building and thousands of small red houses that surround the Academy. Monks and nuns come here to study and learn and stay for a few years before they go to a monastery. Around 50 percent is nun and around 10 percent is not Tibetan at all but interested in Tibetan Buddhism. Larung Gar is a very interesting place with a rich history although it has only existed since 1980. While we were there a higher monk was giving teachings which were open to attend. We were too late for the teachings but did have the chance to meet with this monk and he blessed us with auspiciousness for our journey which was a very special experience. On the way back we had difficulty finding a car to hitch hike back so we walked all the way to the main road and say many birds circling the area. We didn’t exactly know where it was but this was the place where daily a sky burial is held and it is open for tourists to see. We were actually happy not to see it especially after seeing many Chinese tourists coming back from there which is not what a burial should be about. We found our ride and soon were back in Seda to continue on our journey south further into Sichuan and further up and over many more mountain passes. 1- how many km/day are you averaging on these roads? 2- for the visa application did you have proof of flight in/out of the country? We have calculated an average of around 60 km a day which is reasonable with the altitude gain and some rough roads. We also don’t want to be stressed and enjoy where we are. If you are lighter packed and go faster in general more would be possible. We did have an option for flights which we could cancel with an agency, it was necessary for the visa. Good luck with preparing! I cant believe you two are still going. You seem so at home on the road…. We sometimes have a hard time believing! We are still challenged on the road! 1- What were the exact dates of the trip? We ask because we read that July-Aug is rainy season and the roads are subject to closure. Did you ride through the area in those months? 2- Did you have trouble securing a long visa for China, when we last tried rules had tightened? Hi Em, Thanks for your questions. We have cycled this in the last two weeks, so most of it at the end of August. We did encounter a fair bit of rain but it is possible to cycle around the rain. we had most rain during the night. The Chinese are steadily paving roads so we only had one road which was quite muddy until now. For the visa, it is our third tourist visa which apparently influences the chances of getting a longer visa. We applied in South Korea with all the paperwork for three months and were granted a 3 month visa. Hope this helps!